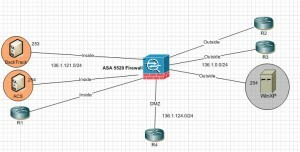 Goal :- To run complete DMVPN setup between Global Data Center and remote locations . Remote location can use 3G dongel and/or ADSL connection. Licenses Used :- Advanced Security license on cisco 881W and 1941. Also for Unified wireless image Advanced IP Services license on C881W router. License portal URL and other information related to licensing. We have a public ip on cisco 1941 outside interface and inside interface is connected to DMZ firewall on vlan 31, through which LAN is accessible. Default route towards internet. We have cisco 881W router , outside interface has a static public ip assigned and a static route towards DSL router. This is simple DMVPN setup with static public ip on both sides , i have used below link for configuration. Test 2:- DMVPN with remote location having 3G dongel. Here we have used IPSEC over GRE with Nat traversal. We have cisco 881W router , outside interface has a static private ip assigned and a static route towards wireless router inside interface. Although we have DHCP configured on wireless router , instead we have used static ip assignment. 3G dongel is connected to outside interface of wireless router. 1.Make sure AP should be in unified mode, else LWAPP wil not work. Converting wireless service-module into unified mode. Step 1 To change the access point boot image to a Cisco Unified upgrade image (also known as a recovery image), issue the service-module wlan-ap 0 bootimage unified command in global configuration mode. Note If the service-module wlan-ap 0 bootimage unified command does not work, check whether the advipservices or advipsevices_npe software license is enabled or not. Step 2 To perform a graceful shutdown and reboot of the access point to complete the upgrade process, issue the service-module wlan-ap 0 reload command in privileged EXEC mode. Establish a session into the access point and monitor the upgrade process. You need to assign ip address in Management range (vlan 10, 10.240.1.2 ) into AP BVI interface and set default gateway towards vlan 10 ip , here 10.240.1.1. Also configure router wlan-gig0 interface like this. Make sure that ip address of controller is reachable, by simply pinging the WLC. Type “capwap ap controller ip address a.a.a.a” or “lwap ap controller ip address a.a.a.a” in order to join the WLC.